Slip21 is 32-bit program for Windows XP later to apply for wireless TWE modules. Slip21 do sampling at an interval of 2, 3, 4, 5, 6, 10, 15, 20, 30 and 60 [min]. The interval time synchronizes PC's internal calendar clock and timer. With TCP/IP connection (no use of any browser), PC can synchronize NTP (Network Time Protocol) server. Slip21 gets Mono Wireless TWE Devices sampling data from Coordinator connected to USB or legacy COM port. 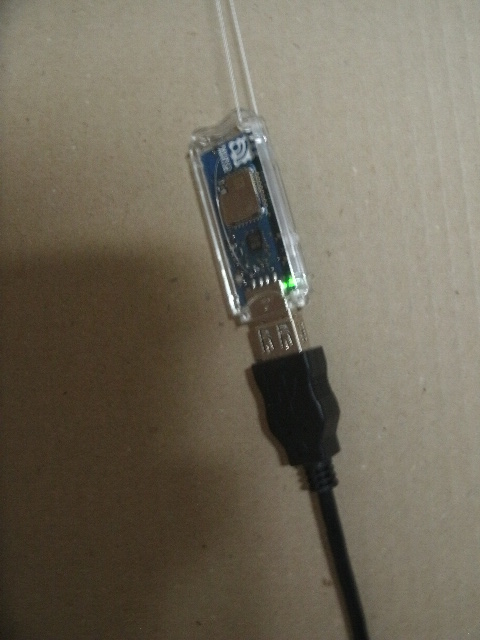 TWE has App_Tag for I2C sensor. Slip21 also shows start time of running, present time at second and elapsed time. You will see installed .NET Framework versions as shown in Fig.24. Without it, you can download it from Microsoft. If your PC is Windows :XP, select Framework 4. If your PC is Windows vista later, no need to install .NET Framework. Windows XP minimum requirements are 233MHz CPU and 64MB RAM. My old 400 MHz PC has been working Slip21 all day long as my remote PC. Windows 10 Home edition cannot control update when we do update. If the OS begins updating without your intention, a measurement loss might occur. You can uninstall update program in case of Windows 10 Home. If you have another PC for your server, I recommend that you will work Slip21 on Windows 10 Pro or older Windows 7, Vista and XP. You can download Slip21 at CNET Download.com. Installer installs all the decompressed flies to an arbitrary directory. If you want to install the directory where old Slip2, Slip21 or TDS298 have existed already, rename Slip.bin to Slip.old. Slip21 makes use of new format. Click the right button 'Slip21' in the start menu of Windows. And execute as administrator. Click Setup, and the setup screen appears shown in Fig.2. If you click the 'Ref' button, you can set or create a folder that you want. TWE.txt has data within 24H daily. Slip21 generates it different from conventional Meas.txt. Assign one of listing 1 - 60 minute. If you set up it less than transmitting interval, it would be meaningless. Assign COM port connecting with Coordinator. Usually COM port is 9600bps 8-N-1 default. Slip21 enforces 115200 bps in case of Monowireless default. Choice either Celsius or Fahrenheit. If you check 'Fahrenheit', The listing temperature values will be Fahrenheit degree. The default degree is Celsius. If you have already opened a data file, reopen the file to refresh the listing. 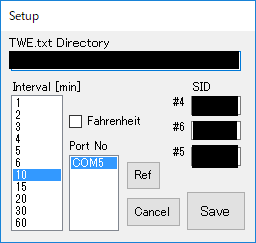 You will find at your SID (Serial ID) of TWE module, when you set up it for App_Tag. Register the SID in the text box. Click the 'Save' button, when you change either of parameters to customize. If you don't change, Click the 'Cancel' button. Slip21 can send SMTP mail like 'Alarm', when an event occurs. Check 'Disable', if it is no use of mail. Click 'Alarm' in the menu bar. The contents is displayed in the text box. Confirm that device number #5 is available. 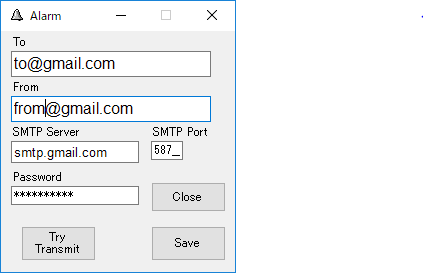 If you want secured Gmail, set up another smtp server. 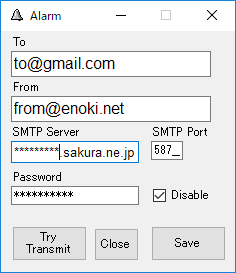 In case of Sakura internet, you can avoid Gmail less secured. But the method is delayed. It spent 27 or 10 seconds. While Gmail smtp delivers in a few seconds. Yahoo Mail address is also OK. 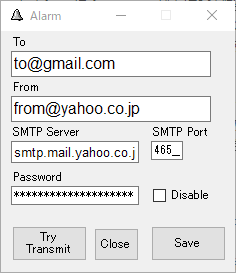 The smtp port number is 465. However, Windows xp doesn't work 'Alarm'. Mailer Outlook for Windows xp doesn't support SSL. So I installed Sylpheed 3.7.0. I confirmed that Sylpheed could send and receive a Yahoo Mail address mail on Windows xp. It seems that VS2017 limits mail socket. Click Measure in the menu bar. Fig.20 appears. Click cyan 'R/S' button, and Slip21 begins receiving at a period of EndDevice transmitting interval. You can change the interval by interactive mode with terminal app Teraterm / Hyperterminal. In general recording period is far longer than transmitting interval, three times. The bottom text box shows receiving raw data. The top text box shows TWE.txt. The columns are temperature, humidity and illuminance order. The labels shows the newest data, LQI and battery voltage. You can watch or confirm receiving status in the bottom of the text box. Click 'Hide' button, it disappears. If you click Measure again, it restores. Click the red 'R/S' button, the button turns cyan. And it stops recording. The button works alternative. Click 'Close' button, and the screen closes. When an event occurs, #5 label displays the status of LQI，Power Supply PS，Battery voltage BAT，Occurred date & time dd HH:mm:ss. If you have already set up sending Alarm Mail, you will receive such as '[Slip21] #5 14 20:42:28 BAT:2847 132' in SUB. 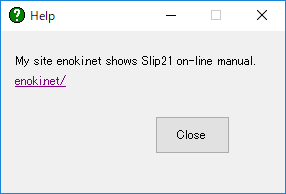 Slip21 has adopted on-line manual. Click the link label. You can access to my site. Click 'Close' button, and the screen closes. Click 'Edit' in the menu bar and Ctrl + Shift + V, Import Meas.txt in LibreOffice Calc, and You will see Fig.12. Put a check mark with delimiter 'T', and Calc takes date and time split. If you take the check mark off, Calc recognizes them long date and time term and replaces 'T' into space. 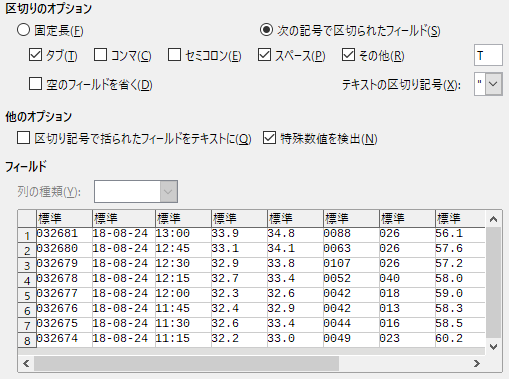 I do not support OpenOffice Calc, because the Calc does export a chart image incorrect that includes time line of date or time. I reuse Windows 98 machine for remote PC. It increased memory and replaced OS for Windows XP. When you go out and want to see the measurement results, you can use your provider's site. You can upload TWE.txt by Windows task scheduler and ftp.exe on time. I updated once in 7 minutes at first, 11 minutes now. A server opens FTP port for customers. I confirmed to upload a file by FFFTP popular in Japan. Confirm to connect your PC with the server, if you run command prompt CMD. Input FTP command. 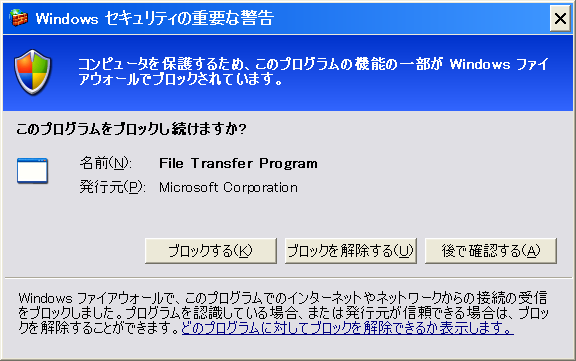 You will see the pop-up like Fig.16 in case of Windows XP. Reset blocking. Check ftp.exe in the fire wall setup screen Windows 7 later. FC2 server disconnects while trying a few commands. You had better a BAT file as follows. Write the full path for **** including drive name. Task scheduler might not recognize current path without drive name. You might upload TWE.txt, when you go out or make a short trip for some days. Task scheduler can fix working time. I have been set 96 hours in the property of the task scheduling. The task scheduler had been working for a month. The size of the Windows Page File had stayed at 333 MB. Without 'AN HTTPD', it is 303 MB now. With more than 24 hours duration, Task scheduler seems to continue working for a long time. When I had assigned the working time for 6800, it happened that Slip21 would stop abruptly as shown in Fig.17. After that, Windows XP Task manager showed 1.33GB of page file. Slip21 will resume, if you click 'OK' button. You should not assign huge number of working time for Task scheduler. FC2 server seems not to accept 'mdel' and 'mput'. You will have to try and error for your server. My targets are Monowireless TWE-Lite and Digi International XBee which are assembled by myself on universal boards. 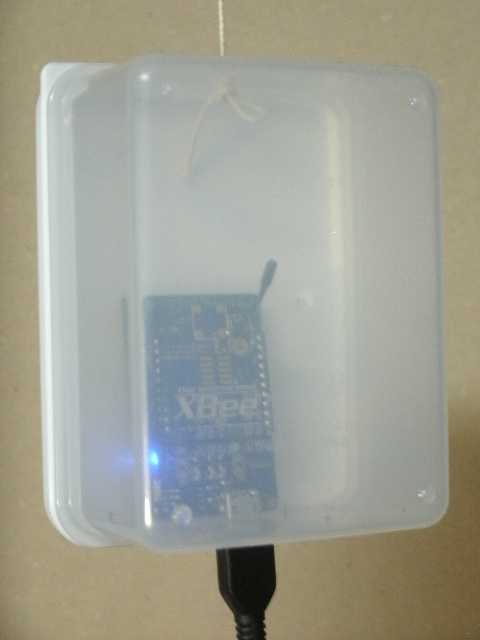 The XBee Coordinator hangs with Switchscience USB Adapter 55cm off the first floor ceiling as shown in Fig.18. While TWE MonoStick hangs off 30cm. The distance of both devices is 1m. I always verify that Slip21 works on my usual desktop PC (Windows 10 Home Anniversary 64bit) and my server. The remote PC is 400MHz CPU with 384MB RAM on Windows XP Home. The display is 1024x768 resolution. Standard App is installed, when you buy TWE-Lite. You have to rewrite App_Tag for Slip21. You can do download at Monoless site as shown in Fig.22. It is simple to use writer and 'TWE-Programmer.exe' writing TWE-Lite, but you have to take it off the sensor device board every time, when you rewrite. I use USB / TTL-232R-3V3 transform module. I attach a header for the module cable on the sensor board. The transmitting interval d 5000 is too short. My duration time is 60000 ms, therefore 60s. And more my device #4, #5 & #6 Sleep Dur has been 180000 (180s) since March 26, March 28 & April 10 2018 each. If you set up shorter transmitting period, battery life will be shorter. I will recommend encryption not to leak your measurement and device ID.